Whether you’re a dealership, fleet manager, rental car agency, municipality or some other organization responsible for asset management and driver safety, there’s no more efficient way to stay on top of recalls than with our solutions for inventory monitoring. Just about every day, new vehicle recalls and factory defects are announced. The pace and volume of recalls makes it nearly impossible to manage a fleet of vehicles manually. 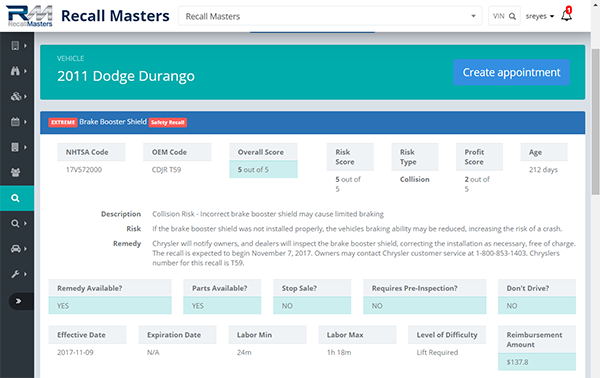 While there are other recall monitoring solutions on the market, there’s no comparison to Recall Masters, which offers a number of unique features in an automated VIN-monitoring platform. The most important feature is ease of use. Once you upload your VINs, you’ll receive a report detailing which vehicles are affected by a recall. Apply settings for daily monitoring and we’ll only alert you when a new recall matches up to a VIN in your inventory. You won’t need to run VINs on a daily basis – it’s all automated. You can edit VINs as your inventory fluctuates or run one VIN for vehicles that you are evaluating at trade-in or at auction. It’s just what you need to know, just when you need to know it! It all starts with the kind of recall data you can extract from our platform. 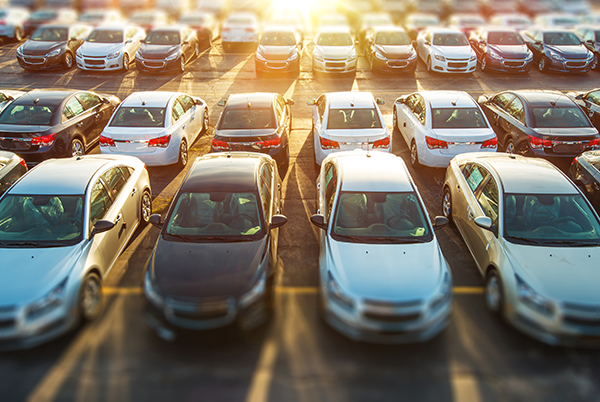 Not only will you receive NHTSA-mandated recall information about every vehicle in your batch upload, you’ll also view other factory notices (also known as service bulletins) that could eventually become NHTSA recalls. Sort data by parts availability, estimated repair times, factory reimbursement, lift/no lift and several other data points that help you manage your inventory more thoroughly without having to invest a whole lot of time. 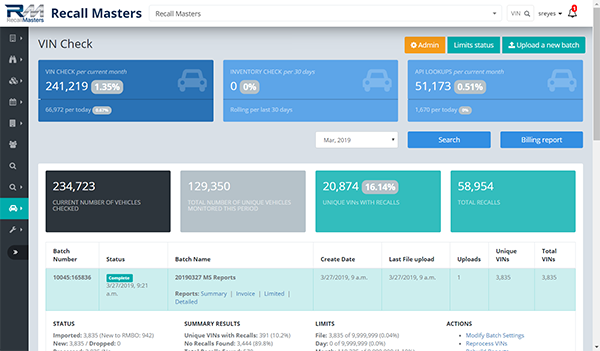 Gaining access to vehicle and owner data begins by logging into the RMBO (Recall Masters Back Office) platform. Start with batch uploading your inventory (.csv file) or looking up one VIN at a time. Our cloud-based solutions make it easy to instantly obtain complete details of any VINs with open recalls. Choose a monthly subscription based on VIN volume that’s right for your organization and keep track of total unique VINs processed online. RMBO gives you the option to deep dive into the full breadth of recall information related to all of the VINs in your inventory, the few you want to run manually and those VINs that are sitting on independent or off-brand lots in your PMA (MarketSMART reporting). Deep dive into the data – it’s all at your fingertips for those dealerships that want to geek out on recalls! Not really interested in “geeking out” on recall data? We’re not offended if you aren’t. Most dealerships don’t need yet another platform to manage. We know you’re busy with the business of running a dealership, selling cars, servicing customers and obtaining the parts necessary to keep vehicles safe and in optimal performance. That’s why we’ll run your inventory and only alert you when we identify a recall affecting one of the VINs in your inventory upload. 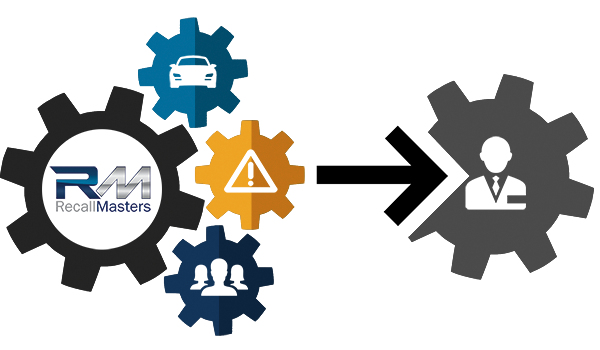 You can even have an alert routed to your parts manager, service advisors, used-car manager and others in your dealership charged with asset management. Since new recalls get announced on what seems like a daily occurrence, we’ll take the heavy lifting out of the equation. Set it and forget it! Recall Masters has developed an Application Programming Interface (API) to pass our valuable recall data to strategic partners and other organizations who already have a preferred platform they work from. For dealerships, our API might be already be integrated with your Dealer Management System (DMS). For a rental car agency, the API might be integrated into the vehicle reconditioning platform. In other words, valuable recall data may be already built into your existing workflow. If you are interested in being a strategic partner or you would like to learn more about where our API is integrated, visit our Strategic Partners page.